Boston’s First African American woman detective, The daughter of South End Physician Columbus Harrison, Detective Dorothy Harrison studied Opera at Boston University but felt she was born a generation too early to have a successful singing career. Harrison joined the Boston Police Department during the Second World War, when female officers were issued badges but did not have uniforms, weapons or automobiles. During her first week on the job, Harrison managed to disarm a distraught a man who was threatening to hurt himself and others with his gun. She responded to this incident unarmed, and had to flag down a passing patrol car to take her suspect to the station house. 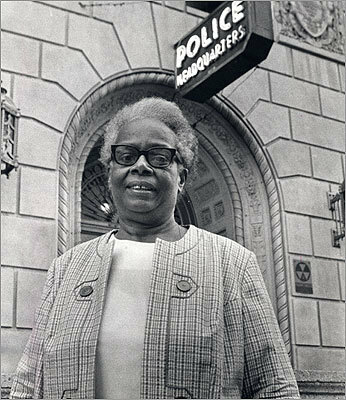 For most of her career, Detective Dorothy Harrison was the only African American woman serving in the Boston Police Department. In addition to her investigative work in the South End, Harrison was a much sought after speaker who represented the Boston Police Department at hundreds of community gatherings.